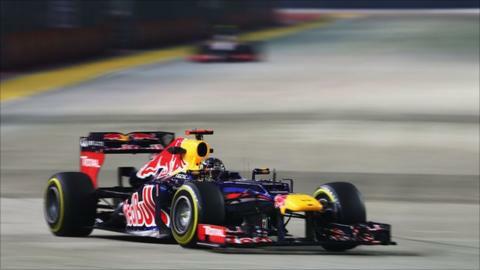 Red Bull's Sebastian Vettel headed McLaren's Jenson Button in practice at the Singapore Grand Prix. Vettel was 0.311 seconds faster than Button, with Ferrari's Fernando Alonso third from Red Bull's Mark Webber. McLaren's Lewis Hamilton, who closely matched Vettel throughout the day, was fifth fastest after running wide at the final corner on his fastest lap. Lotus driver Kimi Raikkonen, third in the championship behind Alonso and Hamilton, was 12th fastest. The Force Indias of Paul di Resta and Nico Hulkenberg were an impressive sixth and seventh fastest, ahead of the heavily updated Mercedes of Nico Rosberg. Ferrari's Felipe Massa and Raikkonen's team-mate Romain Grosjean completed the top 10, ahead of the second Mercedes of Michael Schumacher. Mercedes have adopted a new exhaust system similar to those on the McLaren and Ferrari, directing the gases at the edge of the floor inside the rear tyres to improve aerodynamics. But on the face of it the upgrades have not made a significant difference to the team's competitiveness - Rosberg was 1.45 seconds slower than Vettel and Schumacher was nearly 0.5secs slower than his team-mate. After a disappointing race in Monza, which does not suit their car, Red Bull were always expected to bounce back to competitiveness in Singapore. Vettel was quick all day, trading fastest times with Hamilton until the Englishman's error on his low-fuel lap on the faster 'super-soft' tyres. Vettel made no such mistake, and produced an extremely impressive lap to beat Button by 0.311 seconds. He made up the time in the final sector of the lap - almost entirely of a succession of 90-degree corners - where he was 0.4secs faster than anyone else. "We can be quite happy, let's see what we do tomorrow," said Vettel. "It's only Friday and especially here it's not very conclusive because some people might be stuck in traffic. All in all most important is the car seemed to work on either tyre and we go from there." Alonso had been confident he would be able to compete for pole position this weekend but did not look quite on the pace. The world championship leader was 0.556secs slower than Vettel. The German was also fastest in the first session, which began on a damp track after a tropical storm as dusk fell. The track dried throughout the earlier session, and Vettel ended up just 0.049secs faster than Hamilton. Hamilton ended up 0.624secs slower than Vettel in the second session, but said he felt his error at the final corner had cost him "quite a bit over half a second, so it was good." BBC 5 live analyst Jaime Alguersuari predicted qualifying and the race would be very competitive. He said: "The McLaren looks very good, the Red Bulls are competitive again after Monza, where we knew they were struggling, and again Alonso [is there]. He is driving fantastically and I expect him to be competitive this weekend." The Ferrari does not appear to have the one-lap pace to compete for pole position but his race run was impressive. Alonso dipped into the 1:54s after five laps whereas Hamilton and Raikkonen started in the low 1:54s but then quickly went out to 1:55s. "I would say today was positive even if the first impression is that we are not as competitive as we were in Monza two weeks ago," said Alonso. "We still lack a bit of performance on tracks like this one, where you need maximum aerodynamic downforce." Ferrari brought new front and rear wings to Singapore but the new rear wing was taken off Alonso's car before he set his fastest time in the second session. Ferrari's head of race operations and factory car assembly Diego Ioverno said the team took it off to provide a comparison with the old wing. He said they were still analysing the data but admitted the new part may not be used for the rest of the weekend. He admitted it would be "a bit of a concern" if it turned out that another aerodynamic part that had been intended as an improvement turned out not to be, but emphasised that it was not an unusual situation up and down the pit lane. There were relatively few incidents, although Williams driver Bruno Senna did bring the session to a temporary halt when he tagged the wall coming out of Turn 19. The impact broke the car's left-rear suspension and the Brazilian spun to a halt in Turn 20. Marshals were unable to remove the car, forcing officials to stop the session while it was recovered.